This is the third in a 3-part series. I’m slightly prejudiced here as I’ve been using BBEdit for pure text editing since the mid 90’s. Habit breeds comfort. 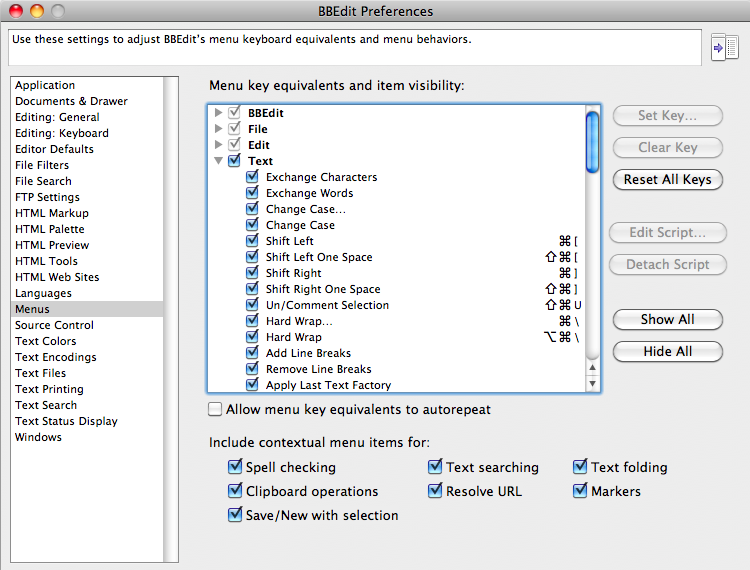 The big brother of TextWrangler, BBEdit costs $99.99, and has been around a long time. In areas it clearly shows its age, especially in the UI. It can be somewhat intimidating for the new user, and debugging errors can take time, indicating the need for better debugging tools, a topic for another time. 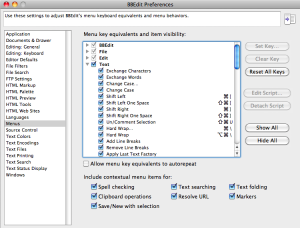 BBEdit has a vast array of keyboard shortcuts, and you can add your own. You also can create text clippings that can be invoked by typing the first characters of the file name in which you saved the clipping, which saves considerable time. Code intelligence speeds up development, but some of the word suggestions can be annoying (though this can be turned off). Balanced braces are not added automatically, but you do get hints when they are balanced, and you can select them to make sure they do balance. Sometimes when writing a function in FileMaker with nested brackets, I’ll bring the function into BBEdit to verify the “(” are all balanced with a matching “)” – a feature I wish FileMaker had in the calculation dialog. BBEdit lets you either open documents in a drawer – no tabs – or independently. The latter is nice when you want to stack documents to compare them side by side. 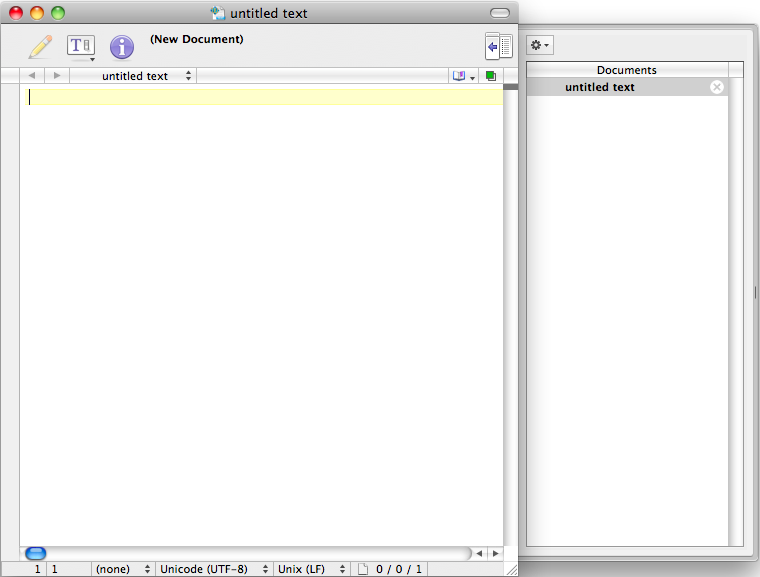 You can do this manually or have BBEdit show differences between the frontmost two documents. Although compared to new apps and IDEs, BBEdit seems somewhat old school, it remains my go-to tool for clean editing with lots of power, but minimal frills. Costing $99 (about the same as BBEdit), Coda looks and feels far sleeker than the venerable Bare Bones product. Created by the same people who make Transmit, Coda bills itself as an all-in-one development environment, with text editing, project management through what it calls “sites,” CSS design, Terminal access via SSH or local shell, and reference books. Coda’s UI is seemless. The Clips palette floats on the screen. You can split the main editing window multiple times, not just once like in BBEdit, and you can split vertically or horizontally. The code completion comes with the reflexes of a cheetah. Adding new styles to CSS documents is a breeze. 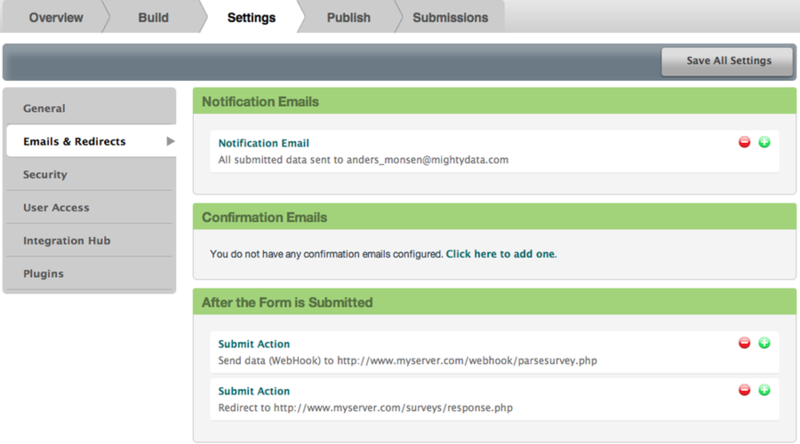 You can work locally or remotely, or work locally and publish to a remote host through the Sites. I wish it would default to open the site files in the navigation panel, and not just the last stored open tabs, but this is quickly fixed in the preferences. I believe that the app you choose will generally reflect your personality. People with PHP experience who already have their favorite app won’t be swayed by any opinions above. After going through each of these six apps side by side I found some that complement each other, and some that make me consider my current choices. I’ve listed the version numbers next to each app, as things change over time as new versions are released. Some other editors worth mentioning include SubEthaEdit, a great collaborative tool; the Java based jEdit ; Smultron, formerly free and now available at the Mac App Store for $4.99; Gnu Emacs a cross-platform tool based on Lisp; Bluefish Editor, with both native and Macports flavors. TextWrangler is the minimum app one should have for any text editing. KomodoEdit, for the amazing cost of $0, is the next choice for day-to-day work. Coda’s UI is modern and self-contained, and for a relatively new app it is hard to resist. BBEdit works well for heavy lifting – searching multiple documents, comparing data, but shows its age. I’ve used it so long, I always held the belief that you could take it away when you pry it from my cold, dead fingers. I know people who feel the same way about EMACs and other text editing apps. Whatever your ultimate choice, writing PHP code can be frustrating, time-consuming, and yet ultimately rewarding as you see patterns and discover shortcuts. Taking the time to become familiar with one or two text editors ultimately will save you hours of effort over time. Creating code snippets and storing these for further use via BBEdit, for example, almost makes me blush every time I call them with five or fewer keystrokes. To learn more about building web pages to display FileMaker data using PHP, check out my PreCon session at FileMaker DevCon, Core Elements of PHP for FileMaker, Tuesday, August 2nd at 1:30pm. This is the second in a 3-part series. In my previous post, I covered a couple of free applications. In this installment, I look at two paid text editors, both with strong caveats. UltraEdit presents another clean, cross-platform option, albeit one that is not free. When I opened the app the first time, it hijacked all .php and .css files and made itself the default application. I prefer a choice in the matter, and although it took seconds to switch back, this was annoying. 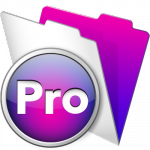 UltraEdit comes with a 30-day trial, and costs $59.95 for a full license. You can open multiple files in a tabbed view. Line numbers are on by default, and color-coding manages PHP and HTML side by side. Find and Replace actions are separated via tabs in the Find and Replace window. You can create project workspaces or work with independent documents. If you have the screen real-estate you can display a variety of views, from files to function lists. This tool might be one to grow with and make the transition to an IDE easier. It also has a Windows feel to it, so if you’re making a transition to the Mac from Windows there might be a comfort factor here. I don’t know if UltraEdit stands out enough from the other apps to make me adopt it as a daily tool, but it’s still a strong app to consider. TextMate‘s strength appears to lie in managing projects, or possibly other development languages like Ruby on Rails, not so much PHP. One very nice feature is that the project window lets you drag and drop a folder into the drawer, and you instantly have access to all the files. Each file you select opens in its own tab. There are pros and cons with tabbed text editor views. The main advantage is real-estate, as you keep all windows within the application. The disadvantage comes when you want to compare documents side by side. Inside each document the color-coding shows up nicely, along with shaded areas where you can fold the code between matching tags. Line numbers were not apparent in the document, only the footer line. Also, the preferences in TextMate are sparse. The biggest downside for the new PHP developer is dealing with code completion. In TextMate this requires that you start typing and then press the ESC key. The function still does not fill in the parameters. For example, in_array just codes as red text and contains nothing after the term. Possibly there are ways to enhance this through some additional programming. After seeing other FileMaker developers advocate for this tool, I’ve tried several times to get comfortable using with no success. You can download a 30-day trial version. 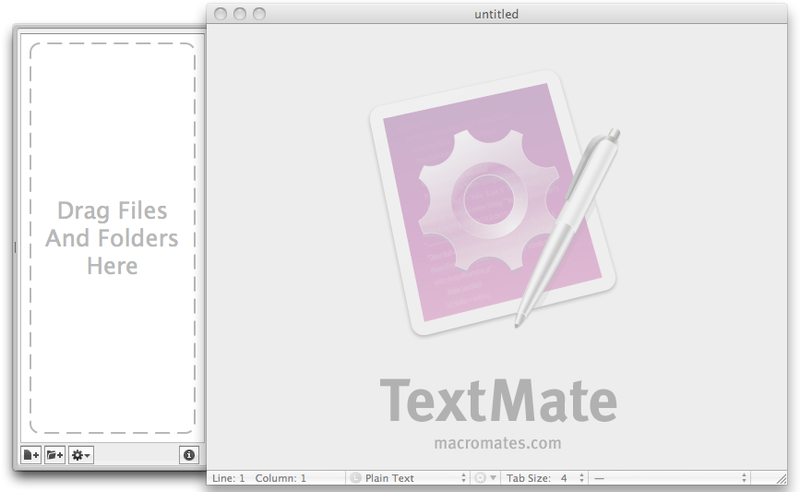 The cost for TextMate is $57. I expected something more for the price so I can’t recommend this for PHP development. In comparing these two paid apps to the free ones in my previous post (TextWrangler and KomodoEdit), both in my opinion fall somewhat short. As I see it, these types of apps should be relatively intuitive, but both UltraEdit and TextMate made me spend time cleaning up, or finding features and ways to use them. In the next post I cover two additional paid apps, both with fewer limitations than these. This is the first in a 3-part series. Anyone new to PHP development with FileMaker will need a text editor application to write the PHP, HTML, CSS, and other code outside FileMaker. In this series of three posts, I’ll review some of the better-known text editors for the Mac OS. I researched this information to prepare for my PreCon session at FileMaker DevCon, Core Elements of PHP for FileMaker, Tuesday, August 2nd at 1:30pm. I’m not necessarily talking about “best practices”. For full-time PHP development, you would typically use an integrated development environment (IDE) with revision control and project management for local and remote files. However, an IDE is a major investment in learning (and in some instances money), and the leap to a fully-fledged IDE rarely happens all at once. Most users start off with an advanced text editor that still has rich features to help with development. I’m not going to cover all available applications, only ones which I have used over the years. The six apps that I will review are sufficiently different, and users will develop their own preferences; in some cases it may be useful to have more than one available. As I do most of my development in the Mac OS, all the tools I mention are Mac-oriented, though two of them are cross-platform. Although every Mac comes with TextEdit, it is far from ideal for reasons because it lacks “code awareness.” For example, it does not have color-coding, so you can see the code on the screen at a glance (PHP vs. HTML), or element recognition, the type of elements in each language (function vs. string). Also, TextEdit tends to save documents in Rich Text Format (RTF). Still, free is good, and two of the six apps I cover are free. These free apps have virtually all the features that you need, and one in particular is worth as much as some of the paid apps. One of the first things I do when setting up a Mac web server is to install TextWrangler. Made by Bare Bones Software, who also make BBEdit, this application is perfect for development at zero cost. It comes with many of the features as its big brother, such as multi-file search, document comparison, color coding, and a vast array of keyboard shortcuts. There is no code complete or clippings (although you can store documents in a Text Factory folder). 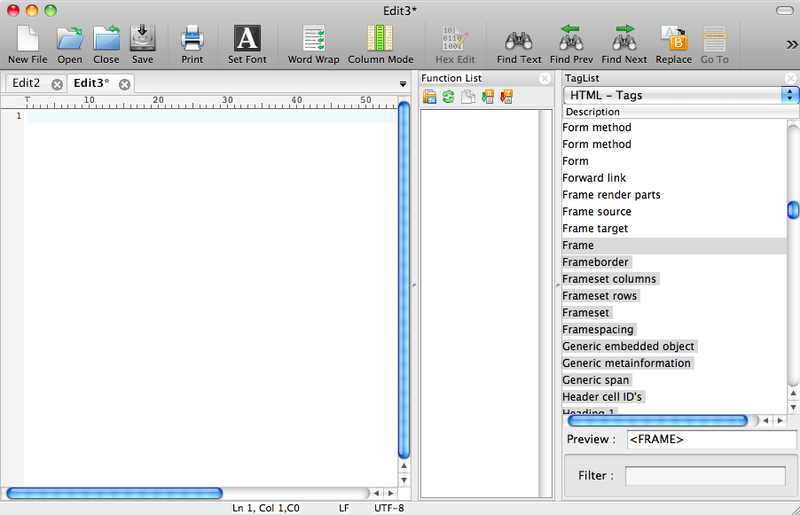 I would hesitate to use TextWrangler for large projects, but it’s perfect for quick work. 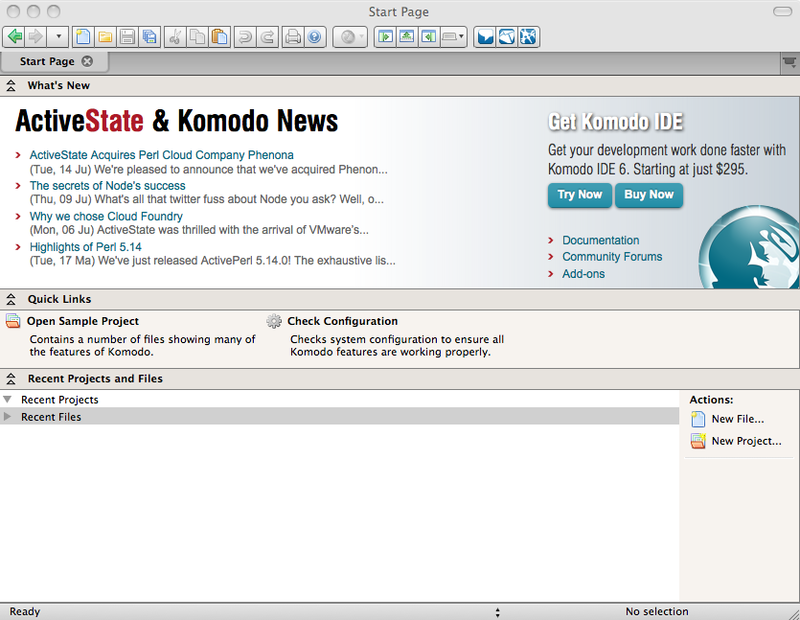 A quantum leap from TextWrangler is the cross-platform app KomodoEdit. I first heard about it from MightyData’s own Visionary of Value, Kirk Bowman, while reading through the DevCon materials from his session on PHP and FileMaker in 2009. Free and cross-platform? What’s not to like? I’ve promoted this app in my own classes on PHP and FileMaker because of the instant value. Clearly, the people who developed this software see it as a gateway to their full-fledged IDE, and they advertise this option in the Start Page when you launch the app. The default extension is a text file, but a simple change in the preferences and your new documents are created with .php extension instead. KomodoEdit is like a mini-IDE, handles project management quite nicely, and even debugs code within the document (to some degree). If you make a common beginner mistake such as leaving off a semi-colon, the area around this gets a red underline to alert you that something is wrong. You can split the text window (like Excel), code folding is intuitive and visual, and the preferences allow a great deal of fine-tuning. 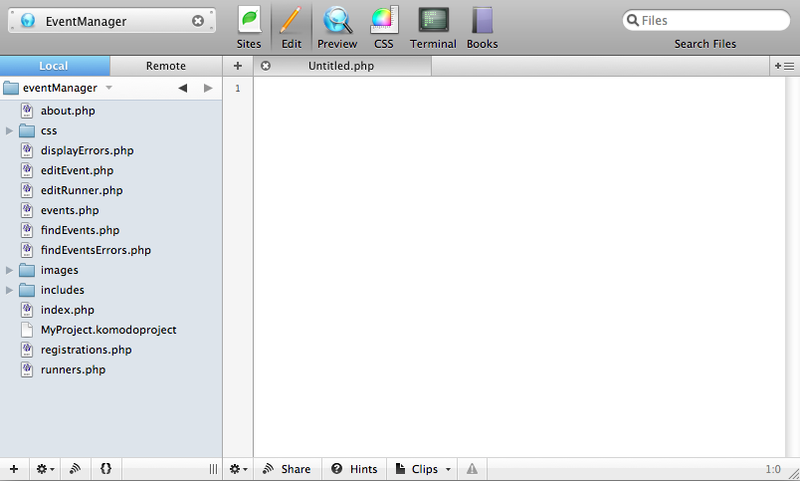 KomodoEdit is hands down the best free text editor for the Mac, and even better than several paid apps. I have on occasion run into strange issues with inconsistent color-coding. Also the soft-wrap option adds a distracting character on the right side of the screen when text wraps. But these are minor issues. And did I mention that it’s free? As FileMaker developers, we rely heavily on FileMaker Pro Advanced, which lets us step through scripts and test variables on the fly. Unlike in FileMaker, there is no Data Viewer and Script Debugger to make life easy in PHP development. We can take a manual approach or just as with FileMaker solutions write a custom function to do all the heavy lifting. When trying to decide the content of variables that fail, developers usually print these to the web browser, using either “echo” for strings or “print_r” for arrays. We quickly discover that large arrays look messy with just print_r, and so the next step is to wrap some “pre” lines around this to format the array into more readable text. Even these three lines can get end up crowding your page as you are writing code. When stepping through the various arrays returned by the PHP API for FileMaker using a newFindCommand, adding these three lines in between each variable, and then commenting these out while debugging, can become tedious. The simple query below has five possible places you might want to check the content of the variable. Writing a function for PHP is somewhat similar to the method in FileMaker. The function requires a name, parameters, and calculations to serve the purpose of the function. You can store your functions in a separate functions.php page that you include in your PHP page, and call the function as needed. The function that I created to check what happens to each variable takes an optional parameter in the end to decide whether to output to the browser. So, I can include this function as one line in multiple places without worrying about commenting out the code. There’s nothing too fancy here. I have in fact borrowed the main part of a function that comes with the PHP Site Assistant installed by FileMaker Server. It checks whether the variable is a string or array. I modified the function to include the key or variable name in bold, and also added the “pre” around the print_r to format the array. When I need to call this function, I simply call one line. The default has only two parameters. Without the optional third parameter, nothing appears on the page. Add a “1” and this function becomes live. The variable inside quotes will let this appear as text, letting you search if multiple variables appear on the page. Often you need stop points after certain sections of code, in which adding the command “die();” would let you focus on just that section. 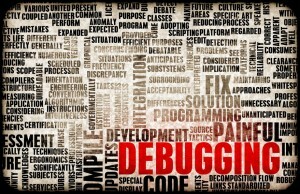 Debugging code is part and parcel of any development effort. Even when everything seems to work great, to echo the arrays or strings stored in variables validates your code and acts as a sanity check. Testing for errors or determining the cause of errors require stepping through all possible locations this may happen. With a function handling displaying the variable contents and not using print_r() on each page, your code ends up cleaner on each page and cleaner overall. PHP is a fairly flexible language, where developers can create sites using linear or procedural code, or complex object-oriented code. The fact that you need to type most of your code and understand a new syntax is daunting to anyone, especially FileMaker developers who are used to the built-in GUI, native script steps, and pre-existing functions. The ease of setting up a database in FileMaker is one of the primary draws of this software. Despite the more manual effort required when writing PHP, there are many analogies FileMaker developers can use to become more comfortable with the code and process of PHP. The core of FileMaker’s logic layer is scripting and calculations. 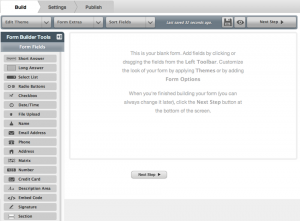 FileMaker scripts are comprised of built-in script steps with various options or parameters. 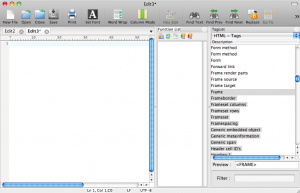 FileMaker calculations combine elements such as text strings, numbers, fields, operators, and built-in functions. Developers can write custom functions, and external plug-ins create more functions. PHP pages often appear side by side with HTML, but strip down the code to just PHP and the appearance is much like a FileMaker script — a sequence of statements, such as variables, function calls, conditional branching, loops, etc. Here the array, $item, and <##> are parameters where the developer must consider content and format, much like Set Field [table::field ; value ] contains two different parameters. Another approach would be to separate PHP functions into two groups: those that look like scripts and those that look like calculations. In the latter group you have built-in PHP functions like substr, number_format, in_array, etc. These tend to appear as short, single-line calculations with one or more parameters. A few years ago Jonathan Stark created a reference page to map such calculations. Here we can see many parallels between FileMaker and PHP, such as Left( “FileMaker Pro Advanced” ; 4 ), which is expressed as substr( “FileMaker Pro Advanced”, 4 ) in PHP. Another useful analogy takes place in the use of variables. FileMaker variables take the form of local (single $ followed by a text string), and global (double $$ followed by a text string) variables. Most PHP variables start with the single $ followed by a text string. Although $$ variables exist, these are called “variable variables” in PHP, and behave completely differently from FileMaker’s global variable, such that novice developers should not use these. Just like the Set Variable [$varName ; Value:”varValue” ] script step in FileMaker, PHP takes a similar format, without the “Set Variable” declaration. Instead, the variable is declared and set with the single equal sign. Understanding variables implies their use within functions. If you declared a variable to “FileMaker Pro Advanced,” you could then use this variable in the function.$versionName = “FileMaker Pro Advanced”;$phpVariable = substr($versionName, 4 );The next logical step is to make the contents of $versionName dynamic, either as the result of a form submit action, or a query. Novice PHP developers run into issues when comparing data, as something like if( $myVar = “this”) actually sets the variable, while the double equal sign is the correct method: if( $myVar == “this”). 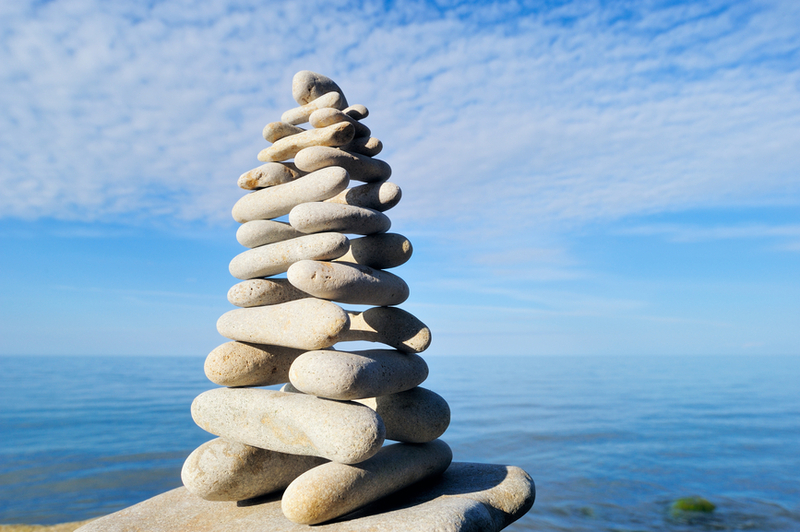 The essence of integrating FileMaker and PHP is expressed in four requirements: Creating records, Reading or retrieving records, Updating records, and Deleting records (or CRUD, for short). Total integration does not stop with these four elements. Getting layout information and value lists can make interfaces more dynamic. There are functions to execute FileMaker scripts and gather portal information, as well as critical error-trapping methods. However, CRUD is the building block upon which everything else stands. One of the earliest and most concise write-ups on FileMaker’s PHP API came from Six Fried Rice on PHP API and FMP 9 from May 2007. All the points made here remain valid. Jonathan Stark and Chris Hansen’s comparative essay on FX.php and PHP API – is an excellent overview of the two PHP classes. Some integration examples of FileMaker and PHP include Joomla, a content management system (CMS), detailed by the folks from myFMButler on integrating FileMaker and Joomla. Another popular PHP framework is CodeIgniter. With minor modifications it is possible to integrate this framework with FileMaker using FX.php. Recently Matthew Leering’s post on Google Analytics and FileMaker showed how you can gather data from arrays and insert these into FileMaker. There are several web services that offer APIs to place arrays of data into PHP variables through queries, which developers then can turn around and insert into FileMaker records and fields. Integration between FileMaker and PHP works both ways, making FileMaker one of these most flexible and powerful database solutions available to individual and enterprise users. From creating custom web front ends to your FileMaker database, integrating with existing CMS frameworks, and writing scripts that import data from web sources into your solutions, the marriage of PHP and FileMaker has tremendous potential. The above examples show just a few of these opportunities.